In the January edition we talked about the club entering a challenging second half of the season. Nothing much has changed since, our two teams are still locked in a battle to beat off the threat of relegation but results have been positive. The senior team, despite currently sitting in the bottom three, have games in hand over their rivals while our Saturday side will hope that home league form can keep them in the Major division. A big effort is required by everyone between now and mid-May to keep both teams flying the flag in the highest grade of football available to players in our catchment area. But less of the doom and gloom, as we go to print CY are still involved in no less than five different cup competitions. With St Patrick’s Day now just a blurred memory, we are into the latter stages of all these competitions with the exception of the FAI Senior Cup. Our Saturday side will host Malahide United in the last 16 of the Lanigan Cup, the visitors are currently second in the league and will offer stiff opposition. The Senior squad have a slightly busier schedule ahead, the draw for an aforementioned FAI Senior Cup takes place at the end of March. This will contain non-league qualifiers and the winners from these games will join the league of Ireland teams in the last 32. CY will be aiming to achieve that feat for a third successive season. Derek Bowden’s charges are also through to the last 16 of the Metropolitan cup. You’ll remember CY were beaten in last season’s finale by Wayside Celtic. In addition to this, a berth in the quarter finals of the Charlie Cahill Cup is up for grabs when CY host Sacred Heart on Friday March 21st. It doesn’t end there. CY have made it through to the semi-final of the FAI Intermediate Cup, the most sought after piece of silverware in amateur football. Having accounted for Cork sides in the last 16 and quarter finals (both away) CY have been handed a home draw and a Dublin 4 derby with UCD AFC. The students will offer a huge test for the honour of facing either Tolka Rovers or Avondale United in the final. CY hold a slight upper hand going into the tie having won the league fixture by a single goal to nil back in October but that will mean nothing for this clash, penned in for Saturday March 29th with a 1pm kick-off on the Astroturf in Ringsend. We hope to see a huge crowd there and thanks as always for the support. 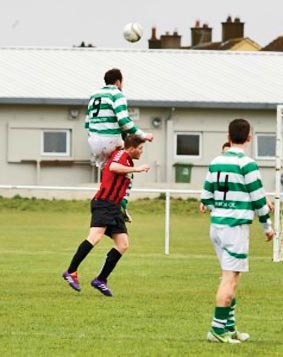 Above: Cherry Orchard versus St Patrick’s CYFC, picture courtesy David Nolan.